MediaWiki is the engine behind Wikipedia, the behemoth website with millions of articles written by millions of users and translated into dozens of languages. Scale, internationalization, and flexibility have turned MediaWiki into one of the most popular open source wiki applications of all times. MediaWiki is also often the first choice for organizations who wish to bring the power of transparency and collaboration into their businesses to publish technical documentation, create knowledge bases, and build intranets. 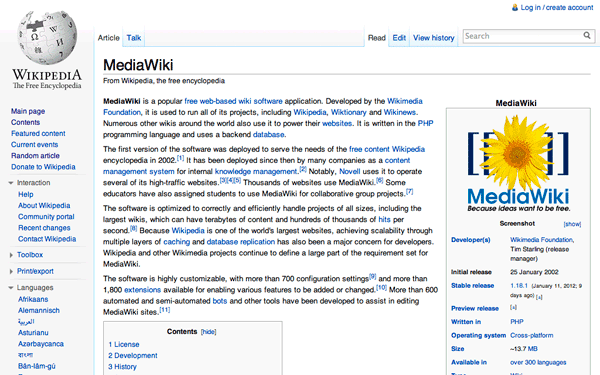 MediaWiki is arguably the most advanced, install-it-yourself, free wiki package available. 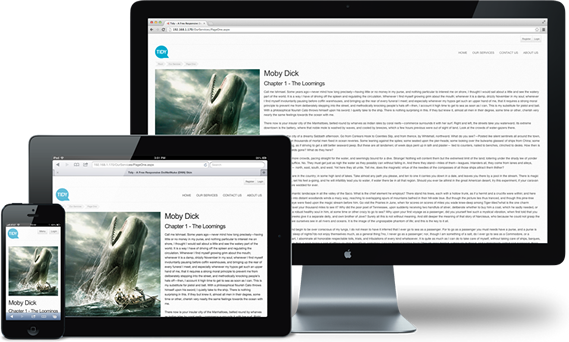 A wiki is an editable web site; you can change each page's content without having to log into a content management system like WordPress or access the server via FTP or other means—you just hit the edit button. While MediaWiki is built for public web sites that anyone can update, like Wikipedia, you can customize it to limit access to certain users. Like WordPress and Firefox, MediaWiki is extendable via plug-ins that add functionality. MediaWiki is also skinnable, which means your wiki can sport a custom theme so it doesn't look just like Wikipedia. MediaWiki has also gained a solid external user base by being open source software from the beginning. MediaWiki used to be really focused on Wikimedia sites, but efforts have been made to make it more generic and better accommodate the needs of these third-party users. For example, MediaWiki now ships with an excellent web-based installer, making the installation process much less painful than when everything had to be done via the command line and the software contained hardcoded paths for Wikipedia.